the LOWEST ADVERTISING COST IN THE INDUSTRY!!! Take advantage of this campaign NOW!!! For more information call (702)970-HTTR or email us to request details. ACT NOW BEFORE THIS OFFER DISAPPEARS! *Listen to samples of just a few commercials that we've provided for some of our valued clients. *Advertising with Hot Topics Talk Radio will save you an average of $3,800 - $5,800 per year!!! Don't sleep on this opportunity to boost your business and products! For additional information, more detailed pricing, and pricing specials on advertising , contact Hot Topics Talk Radio at (702) 970-HTTR. Consider an effective Sponsorship Package with Hot Topics Talk Radio! Your company name and location mentioned on-air, one-time, each week, per month of sponsorship. Your company logo displayed on Hot Topics Talk Radio and HTLV Radio Las Vegas social media sites (Facebook, Twitter, Linkedin, etc.) for 3 months. Your company logo displayed on The Hot Topics Talk Radio Network website for 3 months. Your company name and location mentioned on-air twice during live on-air broadcast) for 3 months. Your company logo displayed on Hot Topics Talk Radio and HTLV Radio Las Vegas social media sites (Facebook, Twitter, Linkedin, etc.) for 6 months. Your company logo displayed on Hot Topics Talk Radio Network website for 6 months. Full production of a 30-second commercial to be aired live, on-air each week (2-play/week/show), and on HTLV Radio Las Vegas (rotating at least six times in 24-hour periods) for 6months. Your company logo displayed on the Hot Topics Talk Radio Network website for 6 months. Full production, 30 - 60 second commercial to be aired live, on-air each week (2-plays/week/show) and on HTLV Radio Las Vegas (rotating at least six times in 24-hour periods) for 6 months. Full production video (up to 2minutes), to be placed on all social media sites (Facebook, Twitter, Linkedin, Google+, Youtube, etc.) and the Hot Topics Talk Radio Network website 6 months. *Donations of product and services are also welcome. Please contact us with specifics of your donation. 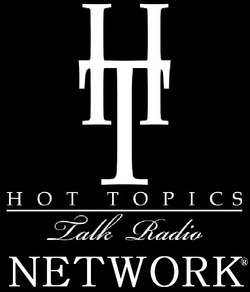 Hot Topics Talk Radio thanks you for your support, and we look forward doing business with you! For additional information, contact Hot Topics Talk Radio at (702) 970-HTTR.